Botswana is a safari paradise and a truly ‘wild’ destination. Our Botswana Safaris highlight the unique destinations in “Old Africa’s Last Refuge” on a rotating circuit via bush plane jumpers – including dry game drives, canoeing wet safaris, exciting walking safaris and more, a never-never land where the beasts roam free as they have done for millennia. The landlocked nation is blessedly underdeveloped, thanks to the severe Kalahari desert that blankets half the country under wind-blown sands. With a small human population, including some of the last remaining Bushmen, Botswana is truly a ‘wild’ safari destination. 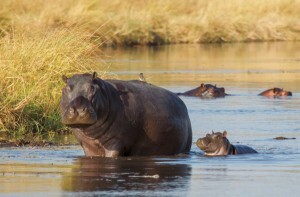 Browse our Botswana safaris listed below and start planning your own Botswana safari today. Botswana is well known for having some of the best wilderness and wildlife areas on the African continent. With its vast array of deserts, grasslands and wetlands, Botswana encompasses the rich diversity and intense beauty of the African landscape. 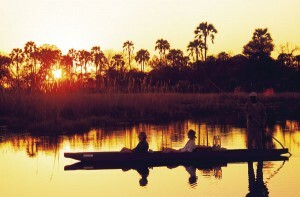 Deep within the Kalahari Basin lies the jewel of the desert – the Okavango Delta. Brimming with wildlife, the Okavango Delta is the largest inland delta in the world and is home to some of the most diverse ecosystems on the continent. Partake in the numerous activities the Delta has to offer like bird watching, game viewing, mokoro (dugout canoe) activities, quad biking and indulge in spectacular photography. In addition to the Delta and desert areas, there are grasslands and savannas, where Blue Wildebeest, antelopes, and other mammals and birds are found. Northern Botswana has one of the few remaining populations of the endangered African Wild Dog. From the Okavango Delta, to the Chobe National Park, Moremi Game Reserve and the Linyanti Swamps, experience the abundance of fauna and flora Botswana has to offer. 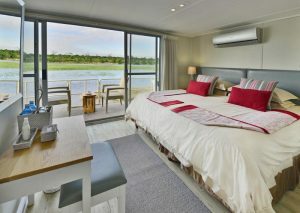 Travel inland across the vast expanse of the Makgadikgadi Salt Pans, to the largest game reserve in Southern Africa, the Central Kalahari Game Reserve. The Kalahari is home to a large diversity of animals and landscapes.